I love to find and remake antique jewelry. This is part exploration, part creation, and part recycling. First I recognize the value of an odd bauble languishing in the dusty glass cabinet of a junk shop, and then I make a lovely setting for it. I do this with writing too. Sometimes remaking involves whittling something from a larger piece. 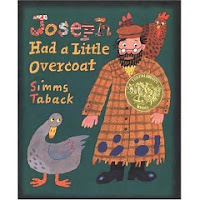 One of my favorite books is Joseph Had a Little Overcoat, a Caldecott winner by Simms Taback. Resourceful, cheerful Joseph finds a purpose, one after another, for his favorite worn-out coat: first it's a jacket, then a vest. When only the tiniest fragment is left, even this is put to good use. I have a novel-length memoir which doesn't have to gather dust while it's making the slow rounds to publishers. A chapter which didn't fly as a Valentine's story became a published microfiction, and it's as tiny as its name: "Two Peas." When you take your ideas out of the glass cabinet, you're sending the message they're valuable. You accept, enjoy and appreciate your creations, large or small. You decide to honor your talents regardless of their worth to anyone else.